With a morning off work and some visibility I was keen to go skiing and get something done. After seeing that Colin, Graham and a few others skied E.N.S.A yesterday and it looked good I was keen to go and give it a go. Reading through my Chamonix off-piste guide I knew roughly what I was going for and now just had to find a partner willing to ski it with me! Nick and Sandy were keen but both had to work (or so Nick thought) so It looked like I was going solo. Carrying two 30m ropes for the entrance I had a bigger pack but minus the shovel and probe it didn’t feel that bad. Getting a 9am bubble at Brevent I was at top of Brevent about 9:30 and headed skiers left from the piste following the obvious ridge, staying well away from the cornices! 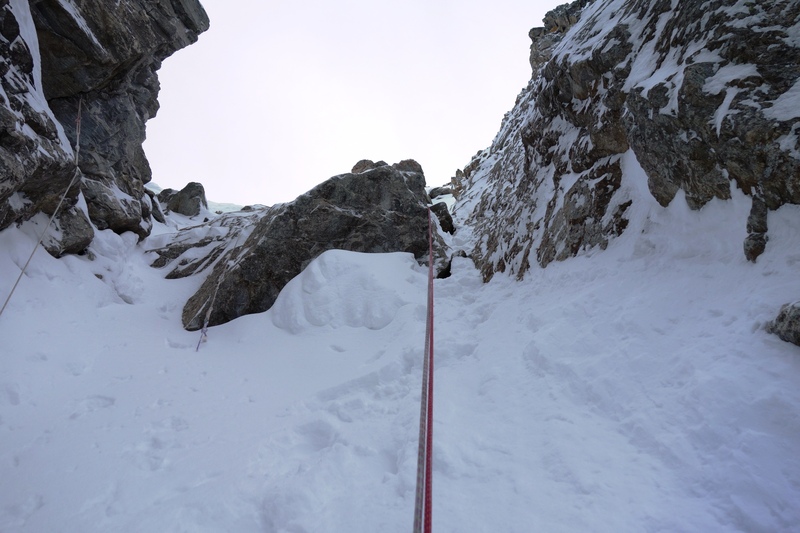 After watching a video of the boys skiing it yesterday I knew there was a small drop just before the entrance so decided to down climb it as I didn’t fancy dropping onto some slightly covered rocks. The down climb was fine and as I got down I saw a guy from Evo2 setting up a belay to lower his clients over the drop. So I knew I had to be quick to get to the rap 1st. Starting the rap and the snow was deep! 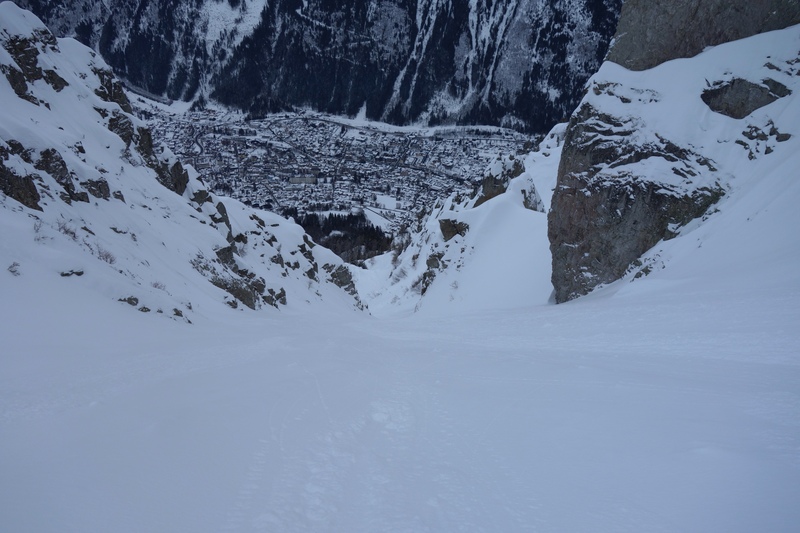 It is possible to ski into this couloir when there is good snow but I heard there was a rap needed to get over the first 5m drop, then a small down climb before you can safely put your skis on. 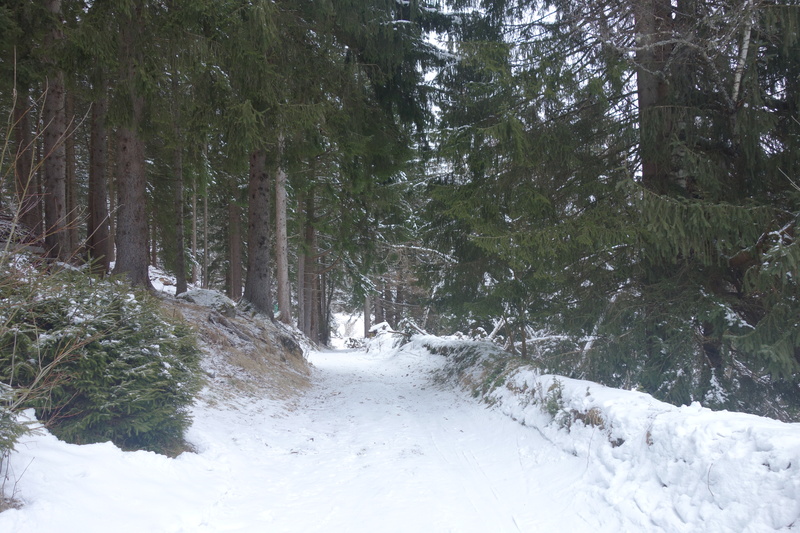 Skis on and I was looking down hundreds of meters of fresh knee deep untracked snow! Alone, Nervous but very excited! 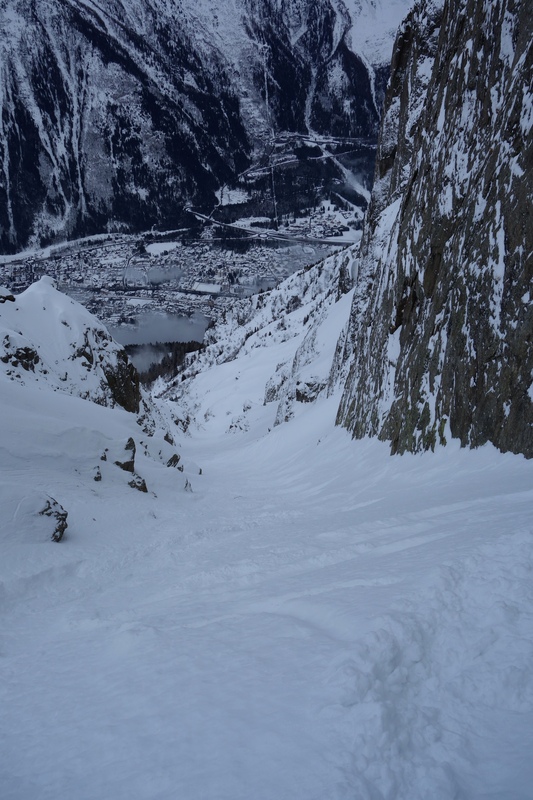 The snow was fresh and light and after a few initial turns I was being chased by some slow moving sluff so cut off to the side of the couloir to let it pass. Being alone I couldn’t afford any mistakes so I continued this process of 5/6 big fast turns then stopping to the side as a lot of snow passed down the couloir. 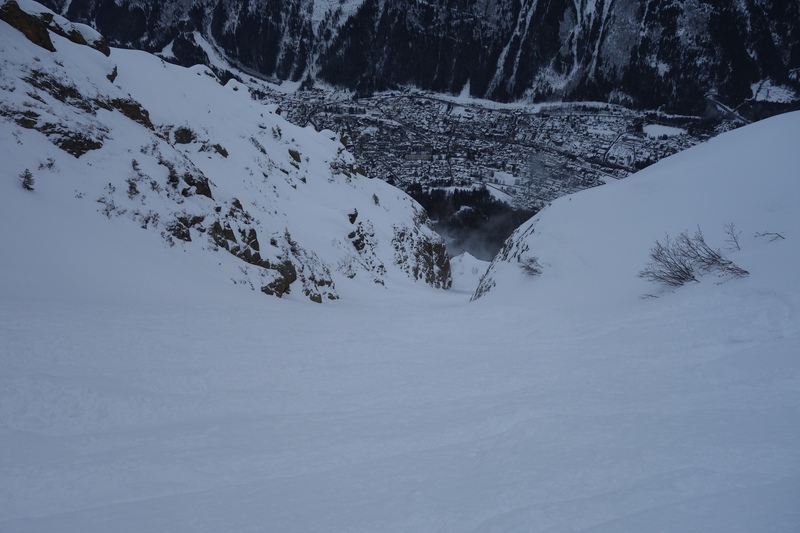 looking back up the couloir at my starting point and first few turns. The great snow continued all the way down to where it opened up to the main Brevent bowl. Nice fast turns in deep snow, what a great start to a Work day! 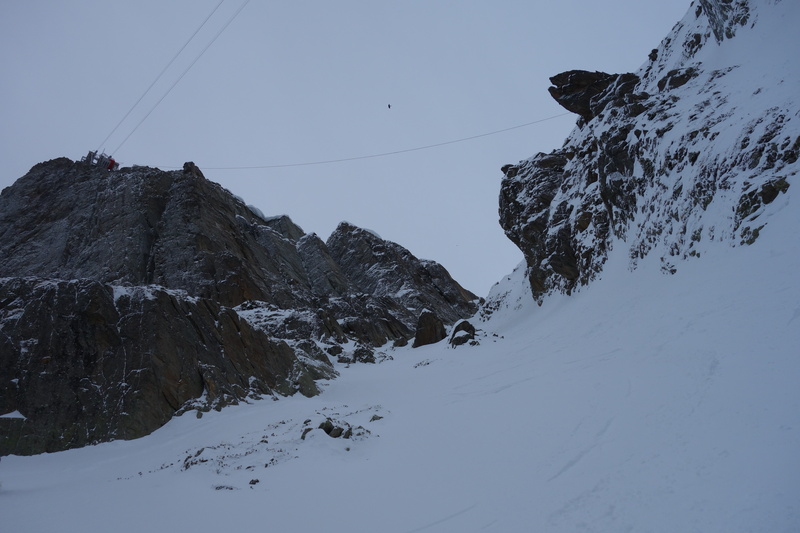 The couloir opens slightly then narrows before tightening again before the main bowl. Following the main snow strip down to the zig zack track I followed this back to the Savoy slope and was back at the Brevent lift before 10:30 heading back up for another look! 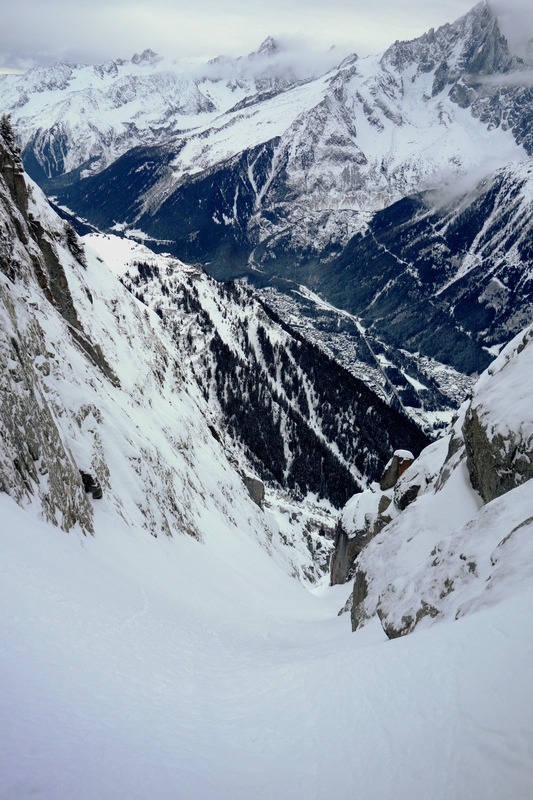 On the Brevent cable car I stood where I could see the Bellim couloir and got a good look at it and saw one track going down. 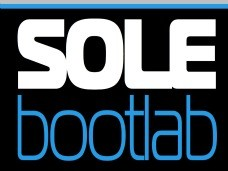 This was next! 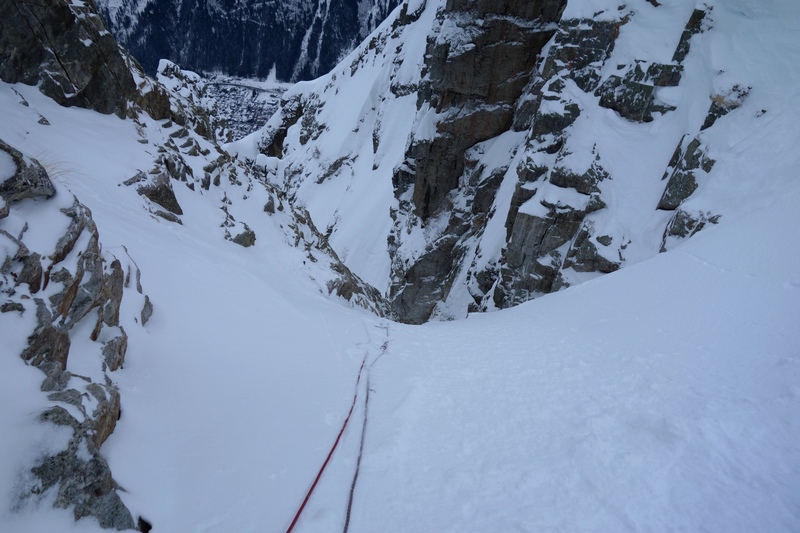 Heading around the front piste then cutting under the ropes you follow the summer route towards the start of the frison roche. This had 2 tracks down it by the time I got to it but it still looked great and there was still lots of fresh to be had, just watch out for the occasional rock! 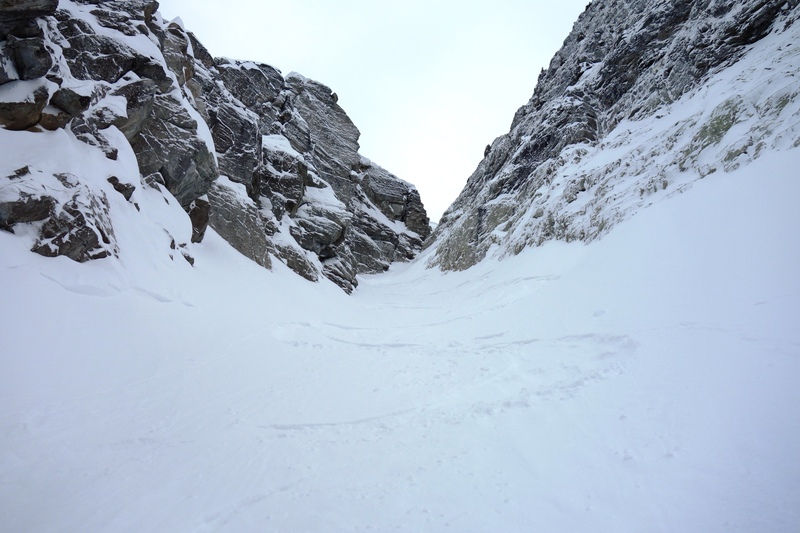 This couloir was lightly less steep and a bit more open in parts. 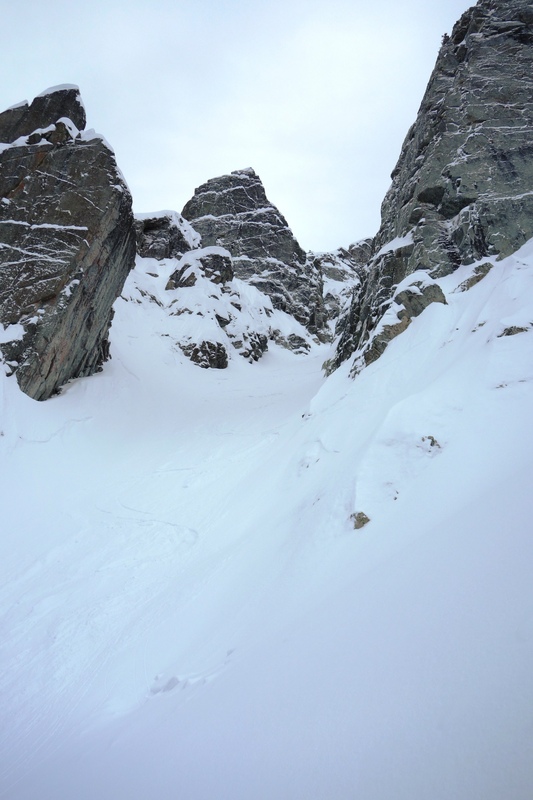 It closed in again before turning back into a bit of bush wacking to avoid the crusty, icy and rocky exit couloir. 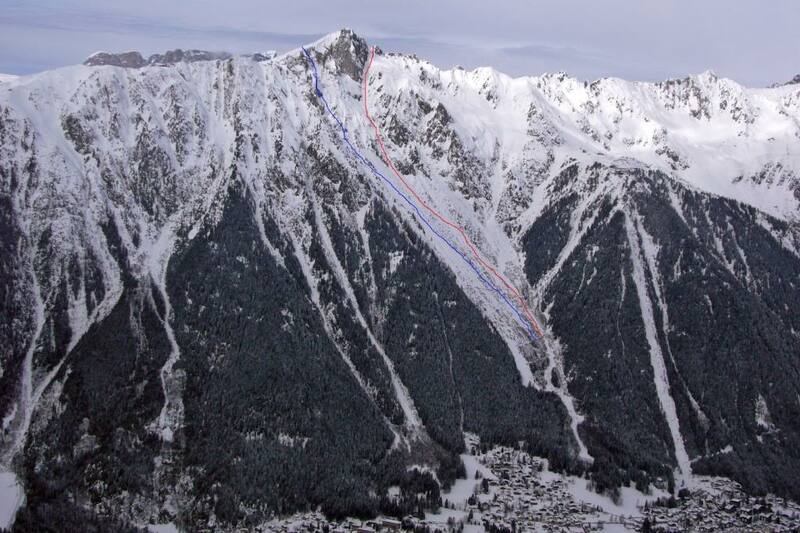 Back onto the zig zags down to Brevent and I had my trainers on by 11:45. What a morning! With more snow forecast these could be an option on bad visibility days! One of the best days I have spent on my own in the Mountains and two huge ticks of my ski checklist!